Project LEADERSHIP Kicked Off at 45th Grand Chapter! The Sigma Tau Gamma Foundation kicked off the three-year campaign Project LEADERSHIP at the 45th Grand Chapter. The purpose of the campaign is to raise funds for undergraduate scholarships specific to leadership development. Specific goals include raising $250,000 and getting 1,400 unique donors over the three-year period of Project LEADERSHIP. The SAGA ... STG NEWS! 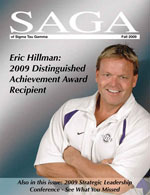 Send Us images, photos or letters you would like posted on this site to: memories@sigmataugamma.com.